Dark Ronins is turning 2!! The Shogun and officers have gotten together and decided that a celebration is in order. So mark your calendars everyone because on January 24th starting at (time TBD) we will be having a Birthday Bash! We will start the evening out with a guild banquet in Divinty's Reach. So bring some tonics, boxes of fun, and whatever else you can think of. After the banquet comes the best part: a scavenger hunt. There will be someone hiding in each district (Crown pavilion, Western Commons, Eastern Commons, Rurikton, Salma District and Ossa Quarter) and your goal is to find each one. Each hider will have his/her own unique 'code'. When you find a hider he/she will mail you the code. Once you have collected all 6 codes, mail them to Sophrix (ronin.3682)! The first 3 people to send me a complete set will receive a prize. Prizes will be sent out after the scavenger hunt is completed. This event is open to everyone on the map so bring your friends, family, mini pets, and imaginary friends! The banquet will be held in Divinty's Reach at our usual rally spot, Dwayna Waypoint. Stay tuned for more events throughout the week, such as a PvP tournament (thanks to Tso and Silent for organizing that!) the ever popular fashion show, Shogun/officer trivia (thanks Charis!) and much more! Dust off your finest boots and gauntlets because we will soon be having our first ever fashion show! All guildies are warmly invited to bring a character to the event and participate. Mark your calendar for January 2 at 9pm CST and start planning your stylish path to victory. Top entries will be awarded prizes and a good time will be had by all. There will be five winners--one from each of the five races. These winners will receive 3 gold. The overall winner (among the five) will also receive a total makeover kit! Also, we'll give out some door prizes, so you might get a prize just for showing up! Is this a party or what? This is a big guild event and the Dark Ronins know how to throw a party! There will be food, drinks, communal bonfire and more. After the contest and party, we'll go on an awesome guild WVW run. Log on and meet up with the guild in-game at the Great Lodge waypoint on Jan 2, 9PM CST. The judges will look at each character there and announce the winners at the party. You can only enter one toon, so choose carefully. How many toons should I enter into the contest? One toon per player/account. No need (or option) to enter a character in all five races. Just choose your favorite and show up! 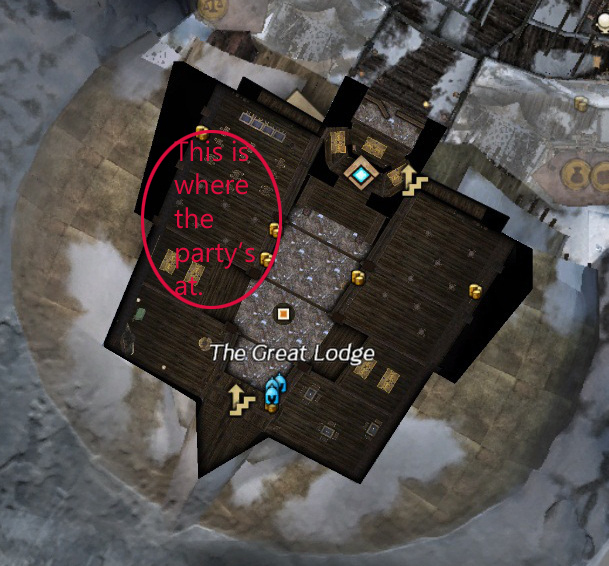 Where is the Great Lodge waypoint, again? We've made reservations at the swanky Great Lodge in Hoelbrak. (In Shiverpeak mountains). Even if you have 0% map completion, you can get there by going through Hoelbrak asura gate in Lion's Arch. The lodge will be directly southwest. Oh no, I can't come! Don't worry, you can still participate. It will be a lot more fun if you can make it to the party, but we realize that not everyone will be able to. To enter remotely, post a screen shot of your toon here and we will consider your entry along with the "in-person" entrants. Please make sure that your toon is well-lit and visible head-to-foot in screen shot. Myself and excellent co-judges Krässen and Mercanus. Don't worry, we won't be entering the contest ourselves. What will the judging criteria be? Dyes: How the dyes synchronize with the armor. Make sure you bring out the interesting elements in your armor with the right dyes, which are fitting for your set. Color Balance: How well all colors work together, this also includes skin or fur or hair. Variety: How many different armor sets were used. Dropping a lot of gems or gold on a complete set of gem armor or T3 armor is not necessary, as mixing sets is a lot more unique and interesting. These criteria are an adaptation of this insightful write-up. Also check out examples and winners on that page for inspiration. I also started a thread here for fashion resources and tips, so if you want even more help with your look, check out the resources there. I got to admit the move to JQ took a toll on the guild, much more than I thought it would. Not quite sure if it's because we have low guild loyalty to start with, or I'm just aloof of what’s going to happen. The move may also be wrongly timed with a lot of key players and even officers off the game due to life events or what not. We been through up and down cycle before and we’ll ride through this one like we always do. For those of you who stayed with the guild (on JQ and DR server) I appreciate your support from the bottom of my heart. Whoever that left the guild; I bid you Godspeed both in life and in game. We’ll be restructuring the guild in the next few weeks. All active guildies on Devona Rest will be set to “Loyalist” rank, if you need help with the move to JQ, let officers/myself/Sophrix know and we’ll pull a loan for you to move over and join us. Folks who are not repping the guild anymore will be move to Emissary role (Guild rep is required even on DR server). Krassen will be our sole officer on DR server to continue queue guild boons and missions (trek/bounty/challenge) so you still get the benefits of repping the guild on DR server. We’ll also be cleaning up our rooster and removing inactive “Ronins” on DR server from guild rooster. Please mail/whisper me if you have a friend that (doesn’t play much) but would like to remain in the guild. Now we have all our core players and officers on JQ server, we’ll be on a recruitment overdrive. I’ll be reinstating the recruitment bonus of 0.5g per new active recruit on JQ server (please claim from Silent). Everyone on JQ, please post guild invite when you enter and exit a map instance. It only takes a few secs and you’ll be helping the guild out greatly by doing so. Also you please introduce the new recruit to the guild, get them register on the guild website. Although I wish to be in WvW 24/7 (it’s a blast on JQ server), I think I’ll take a short break from it, and run my new toon Asura Elementalist with a pink afro (oh yeah, take that!). I’ll be hitting some low level maps and advertising like a whore, please do the same as well if you can. As always, life goes on, it’s the journey that makes it special. Thank you all for making the journey with DR guild a memorable one. This will be my last MMORPG and I want to see it end at a high note. Trust me we’ll be in full force again on #1 ranked NA server. God Bless! •	Guild upgrades and influence are server bound and DO NOT transfer across server. So we’ll need to rebuild the guild on the new server. •	Items in the guild bank DO NOT transfer across server, we’ll need to sell off or carry across server in our personal bank. Once transferred, you’ll not be able to access the guild bank on Devona’s Rest server. •	If you have personal guild bank, you need to move items off it before transferring across server. •	Items in the personal bank will transfer across as that’s account bound. •	Transfer fee is 1800gem and roughly equate to 90gold. •	Silent and maybe 1-2 WvW volunteer will transfer across the selected server before Friday Oct 4, 2013 to experience their WvW reset nights/queue/community/etc. We’ll be the guinea pig and decide whether the new server is “right” for us. At the meantime, PvE players can guest over to experience the community and PvE environment. •	We’ll also be laying the ground work for the guild, setting up Teamspeak channel, getting in touch with their community lead. Silent will be contacting an established WvW guild on Jade Quarry server for the guild to partner with as we get assimilated into their WvW community. •	If everything works out, we plan on moving guildies to the new server from Oct 11 to Oct 18. Our goal is to get everyone across by Oct 18, which is the start of WvW league (https://www.guildwars2.com/en/news/world-vs-world-season-1-begins-october-18/). If WvW rewards do not matter to you, you can transfer after Oct 18. •	Dark Ronins guild on Devona’s Rest server will be running for a few months before we get the guild fully upgraded on the new server. Guildies on the new server will guest back to run weekly guild missions i.e. bounty/trek/challenge/etc. 1-2 Officers will remain to run Devona’s Rest guild for the time being. •	The guild will be running a series of gold farming activities ranging from dungeon, nodes gathering to champ farming. •	Guild will keep magic find, gold find and gathering boons running at all time. •	Officers will be organizing a series of easy and efficient dungeon runs i.e. AC p3, HOTW p1, SE p1 and COF p1. Every night, Silent will be calling out run for the following dungeon paths (priority will be given to new runners as other experienced players can run with PUGs). Estimate about 4-5gold and hour depending on the run. •	Orichalcum and ancient wood nodes: If you have several level 80 toons, you can rotate your characters and gather nodes for sell. It takes about 10-15minutes a map and you can get 1.0 to 1.5 gold per map (http://gw2nodes.com/). For lower level characters, you can gather soft/hard woods and iron ores for sale, it’ll be less efficient, but still a viable option given the abundance of it. •	Champ farming at Frostgorge Sound and Queensdale are highly profitable (averages 3-5 gold an hour, could be more if our find exotic drops). •	If you have additional unused skill point, you can buy cores of trading post and convert them to lodestones for resell. I make roughly about 10 to 12 silver per lodestone and you can make about 20g from 100 skill points. Be smart about using buy order for buy order for the mats and always use sell order instead of selling to the highest bidder. Lodestone is a hot commodity and they sell real quick. Here’s the math: (0.85* price of lodestone) – (2*price of core + price of eloquent wine + price of crystalline dust). I find that destroyer, onyx and charged lodestones gives me the highest profit. It’s advisable to check which one is the most profitable at the time and make the lodestones in batches 25 to 50 so you do not oversupply the market and cut yourself off profit. •	A “Transfer Load Fund” will be setup to help guildies who want to transfer across before Oct 18 but wasn’t able to accumulate enough gold. •	“Rich and generous” guild will pool together a fund which will then be distributed and extend to fellow guildies as a loan. •	Silent will serve as the banker and keeper of gold. Please send gold directly to Silent if you wish to be a funder. •	All funders and loaners will be listed on our guild forum for accountability reasons including username. •	It’s expected that the loaner to repay the loan ASAP. If he/she quit the game or switch guild, please be thoughtful and return the gold to the guild. Failure to do so will be reported as theft to Anet. •	Once the server transfer is complete and loan returned, Silent will disburse the gold back to the funders along with some cookies. As some of you have known, myself (someone of you included) have been adamant about moving the guild to a higher tier/population server. With upcoming WvW league, most guilds from Devona Rests have moved server to higher tier where there's a healty population for both PvE and WvW players. If you havent realized this (I didnt when I first play the game)WvW is a very vital component of a healthy server, without a supportive community for WvW the server will eventually decline and reach a state of a zombie server (like where we at with Devona Rests). 2. WvW is in disarray. Commanders sigiling (bandwagoning) for glory and not very supportive of the server goal. We'll ask a commander to bring his zerg over to ninja garrison or keeps at enemy's borderland but hardly get a response. It’ll just be like a 5 minute hop that’ll grant the server some key points to win. 3. No commanders use TeamSpeak to communicate and everyone is fighting for his/her own personal glory. The number folks on the server wide teamspeak is really pathetic. I'm the only one on WvW channel along with some guildies from DR.
4. No one seems to be interested in WvW. I got ZERO response from posting a guild invite after taking 2/3 of Eternal Battleground and Ferg's keeps and garrison. A big ZERO, really???? 5. Older premier guilds like RegA has no interest in WvW. When they have thier 30+ zerg at Jormag, I tried to ask them to hop into WvW for a tower farming run but the response I got is "F**K WvW* from their guild lead. Kinda disheaterning to say the least, when I used to look up to their guild and their guild lead. 6. As far as PvE, I realized the people running meta-events have been gradually droping. I no longer see familiar faces/guilds and at times 2/3 of folks there is from DR guild. Coordination is rather pathetic as well as far as server wide events. There's no server wide community forum to organize fun events or killing of Tequatl. 7. It will be a while before Devona’s Rests will recover with upcoming WvW leagues. Maybe 3 months, 6 months or maybe never. 8. Very few Oceanic/European players/community to speak off on the DR server. Our WvW and PvE experience will continue to suffer because of this. 9. Our guild growth has been rather lackluster @375 with about ~30 active. I don’t think there's a problem with the guild, again I think the server is incapable of supporting the guild goals/. I’ll like to point these facts so everyone on our guild can decide whether the guild should stay on Devona’s Rest server or move on. It costs roughly about 1800gem to move to a higher tier server and there’ll be fairly small disruption in terms of guild missions (bounty,rush,etc) as we can guest over to run them while we rebuild the guild influence on the new server. This decision has to be voted by all officers on the guild (preferably before Oct 4 with the start of WvW league). No matter that the outcome is, I’ll stay where the guild decide to stay and fight a good fight even on Devona Rest’s server. So pls talk to other members of the guild and have an open discussion of their thoughts and then decide what’s best for the guild. August we had set a few goals: to bring in 100 new members, more WvW participation and to have more people register on our site. I think we have more WvW participation now then we have the past couple months including setting up a YouTube channel. The formation of our WvW guild helped with that a lot in bringing WvW players together and forming a formidable squad. WvW guild is always looking for more players, pls whisper Silent/Sophrix of any of our officers for an invitation to the guild. I have also seen a lot more people register on our site. We reached our goal of 350 members early September, thank you all for your help in recruiting new guildies. We have to weed out a few members who did not reflect our guild culture and respect for all players. It's part of the growth/weeding process and we should not stop recruiting because of a few bad apples or the guild will slowly wither away without new players. Now for September goals. Silent and I decided to not set any hard goals for the month. We would like to spend September getting to know the recruits we brought in during August and to spend more time as a guild in WvW. There is no recruitment goal, but please continue to bring in new players. We expect our officers to play a bigger role in recruitment as well for September which will be address in the officer forum. Once our guild is capped at 500 members we can focus of weeding out the inactive players and hopefully we can have one of the most active guild on our server. For WvW guild, we'll focus on improving the squad we have and encourage more participation from all guildies. We consistently have between 8-10 runners in the squad and would like to increase that to a squad side of 15 in order to flip towers. WvW is really fun to run as a guild, build camaraderie, and a stronger bond. Silent will keep on pestering all folks to download TS3 (do not have to speak if u're super shy) for more efficient communications and squad maneuver. Training/support will be provided to anyone that's interested in being a commander. All you need is some guts and "Stay Alive or Die Fighting" attitude. Check out our awesome video you YouTube, if you're not hyped by the pink warband, I'm not sure what else make you more excited about this game....Jumping Puzzle?? HELLLL NO! Hey guys, Sophrix here! Before we get to official business, I would like to thank Silent for promoting me to co-guild lead and for the support I've gotten. So if there is anything you need, or any questions you may have, feel free to pester me! Alright, moving on. During July the guild officers decided against setting a recruitment goal and to instead focus on getting to know each other, and just having fun. We all had a good July, the guild continued to grow and I think we all had some fun. For August, we would like to set a recruitment goal. The guild is flatlining around 245-255 members. By the end of August, I would like to see the guild at 350 members. Please do not spam invites though. If you see someone without a guild, whisper or mail them to find out if they want one. Most new players haven't figured out whispers yet (It took me a month to figure it out -.-) So if you see someone below level 10, just mail them. Our secondary goal is to have more WvW participation. The one thing I hear the most while recruiting higher level players is "I've never seen your guild in WvW." We need to fix that! Silent and I will not kick guildies who don't WvW, however we will like to see everybody atleast give it a shot a few times. We would also like to see more players registered on our site. It only takes a few minutes to make an account. So when you recruit someone to the guild, please ask them to go to our site and sign up. If they ask why, let them know that our calendar of events is posted there. We would hate for any players to miss out on bounty training, guild trek, or whatever else we may have planned. All the officers would like to welcome Jael to our ranks! He continues to show a good attitude, is an active player and helps other guildmates when they need it, which is what we look for in an officer. So next time you see him on, tell him congratulations! Final thing: please review the guild rules. The guild Lords are having to put a stop to conversations recently due to them crossing the line. So please read them and abide by them. 1. Be friendly to all and demeaning new players or guildies will not be tolerated. 2. Communicate and resolve conflict quickly and quietly. Drama is not tolerated in the guild. 3. Sexist and racist comments will not be tolerated in the guild chat or voice chat. All chat/comments must be PG13. 4. Loyal, positive and helpful guildies will be promoted quickly. 5. All guild members are encouraged to recruit new members to the guild. 6. All ranks including Shogun are replaceable. Rotating ranking officers are encouraged depending who’s available (life events get in a way sometimes) and can contribute most to the guild. 7. Occasional repping of other guild for social purposes, WvW or bounty are allowed except for ranking officers. (Only special circumstances applies for ranking officers). 8. If you are repping another guild for more than 50% of the time, please inform officers so you’ll be move to an “Emissary” role. You will not be kicked from the guild and can still seek help from the guild. 9. All guild organized events have a drop-in and drop-out policy. We do not force anyone to join in a raid or dungeon. We do however encourage guildie’s participation and make it fun for everyone. 2. Get to know one new guildie and partner together on a dungeon/PvE/or anything that he/she needs help on. 3. Invite 3 new guildies to the guild. This guild will only go-on if we keep on recruiting. The guild will die a slow death, the moment we stop. [optional] Get on TeamSpeak 3 if you wish. No worries, you can stay quiet and silent like I usually do. It'll help us on dungeon/bounty and WvW run considerably and build stronger bond.